Here is this week’s prompt, kindly provided by Priceless Joy . . .
For this story, I’ve resurrected a couple of North of England-type characters from a piece I wrote a while ago for Monday’s Finish the Story entitled, Wine and Women. Harry has now happily returned from his little trip in the spacecraft. So here is this week’s story . . .
Fred stood beside his best mate, squinting up at the new church atop the hill on the edge of town, trying to decide whether he liked it or not. 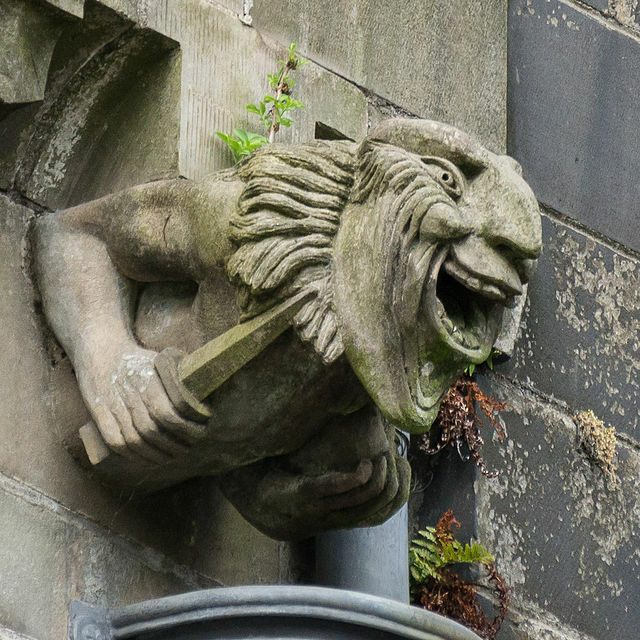 In architecture, a gorgoyle is a carved grotesque (an ugly or comically distorted figure or image) with a spout designed to convey water from the roof away from the sides of the building. 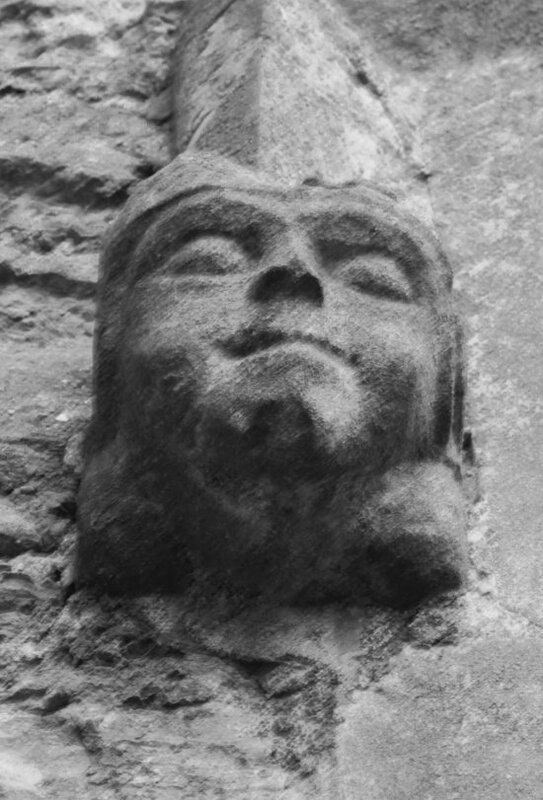 A trough is cut into the back of the gargoyle and rainwater exits through the open mouth. 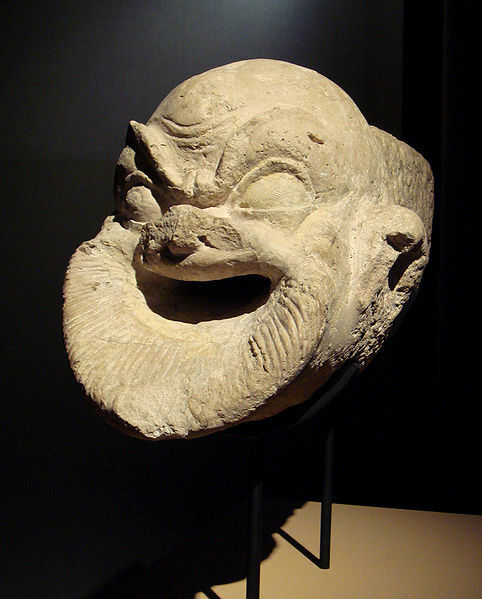 The length of the gargoyle determines how far water is thrown from the wall. 1. To convey the concept of evil – especially useful in sending a stark message to the common people, most of whom were illiterate. 2. 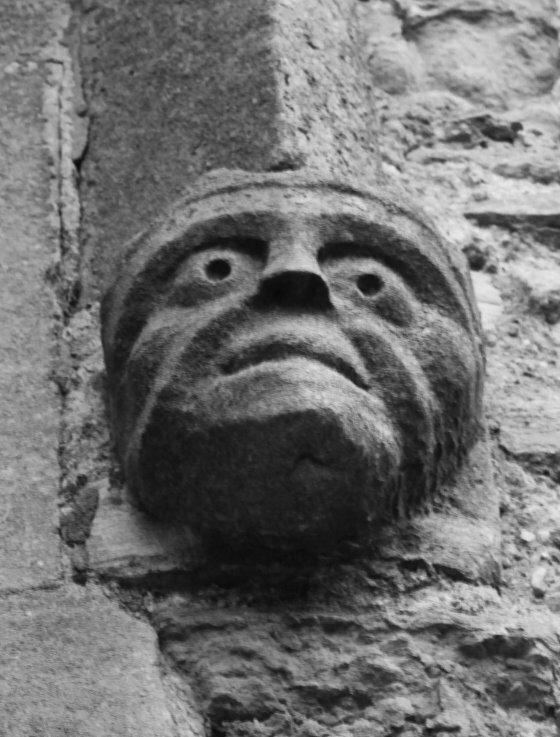 They were also said to scare evil spirits away from the church, thus assuring the congregation that evil was kept outside the church walls. 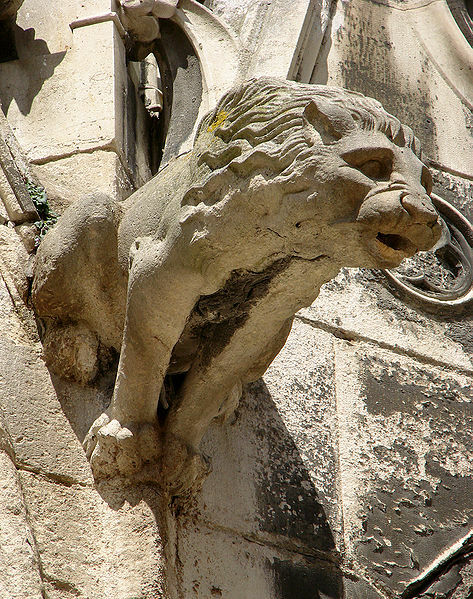 Gargoyle in form of a lion Cathedral Saint-Etienne de Meaux. Author: Vassil. Loved the story and the dialect Milllie. Fred really made me laugh. He was all for going to church when he found out it was led by a beautiful woman! Haha! I just found out yesterday that Louise is your daughter. I was thrilled to know that. She is so sweet and helpful to me. I’m glad to hear that because the names are difficult for me. I understand that they are historical names and cannot be changed. I think this is going to be a very good novel though! Do any of your other children write? My eldest daughter has a book based on archaeology to write (she’s an archaeologist). But it will be fiction. Goodness knows when she’ll get round to it, though. None of my four sons write – it seems to be just us women! Oh, then you have another daughter that also writes. Sounds like Lou is going to write a very interesting book based on archeology. LOL! You are so funny. You don’t have too many children. You have a wonderful family of 6 children! I think I have it straight now. Your oldest daughter is the archaeologist and writer and Lou is the fantasy writer. Lovely to chat with you too Mille. Loved it….well done Millie. Now I know good story telling runs in the family. I forgot to mention the extra read. So much I did not know about gargoyles that you pointed out. Thank you for sharing that as well. That dialect is great! It added to the realism and I could hear their voices while reading. 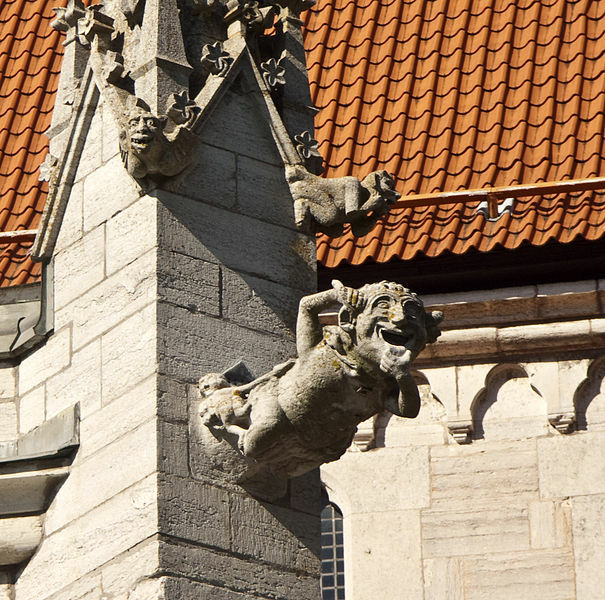 Gargoyles are fascinating little or big things, and the history you attached is very interesting. Interesting story and way of speaking. It is not that strange with a bit of imagination one knows what is happening. Love the extra information. Now I know why those “sculptures” are there. Interesting piece I enjoyed your characters. Also, thank you for the explanations at the bottom they were very helpful. Funny…just the mention of a “interesting woman!” …and Fred gave up any concern of what the church looked like! Lovely plan. Look forward to seeing pictures of the gargoyles. Fingers crossed. 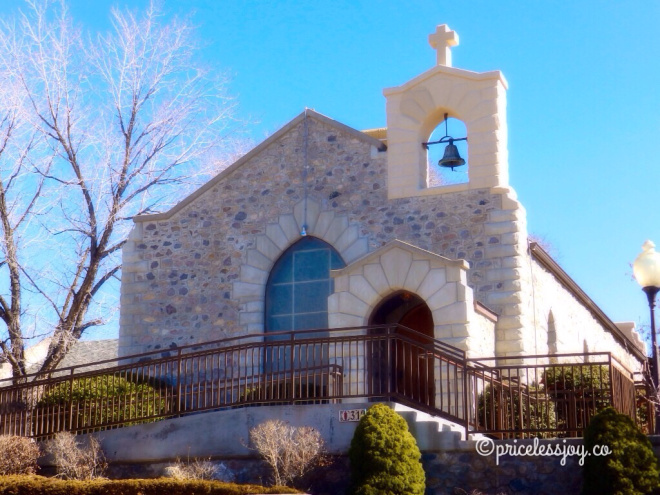 I adore old-style architecture, especially medieval churches and cathedrals. Nowadays buildings go up so quickly and decoration is probably the last thing on the builders’ minds. We have boring box-shapes now – with a few exceptions here and there. 😦 Thank you for reading both of my stories! 🙂 I wanted to do the dialect, so Fred and Harry seemed the perfect choice. I enjoyed the voice in this but even more, the comments that followed! Brilliant dialogue, (and dialect) …hahahaha. I could just hear them. I laughed so much I have a belly-ache Millie. And thank you for the extra. The gargoyles are fascinating. Harry and Fred are so amusing. You’ve developed their characters so well, Millie! Great way to get Fred to Sunday church 😛 Love it when you do dialect. I like gargoyles. There are some on the outside of old buildings around my hometown. They aren’t a scary ast the Church ones.